Fifteen years ago today, a great tragedy swept the nation and rippled around the world. We take this occasion to pause and wonder: Can/should music educators, music students, and community musicians put their creativities to work—in small or larger ways—to commemorate this anniversary, inspire hope for a better world, and/or celebrate the valor of those who bravely serve to protect our communities and nations? If so, why? If not, why not? If so, in what ways? Should students compose music—e.g., songs, rap verse, performance/art pieces—that support people’s social rights and challenge wrongs? Should students arrange musics that were specifically composed as tributes to victims of 9/11 and other tragedies past and present—e.g., Bruce Springsteen’s “The Rising” or “The Empty Sky”; Alan Jackson’s “Where Were You”; The Beastie Boys “An Open Letter to NYC”; and Neil Young’s “Let’s Roll”? As you weigh these questions, we leave you with a music video that “performs resistance” and may inspire hope among some listeners and music makers. It affirms that people can make music toward change. The video is based, in part, on Bob Marley’s “War.” Marley composed the song in 1976. The lyrics are nearly identical to the speech that Ethiopian Emperor Haile Selassie gave in 1963 at the United Nations General Assembly. It was the first time that a head of state spoke in the name of Africa at the U.N. Selassie’s speech called for world peace. Both Marley’s song and this video echo the need for world-wide positive change. Maybe our music classrooms and musical communities can/should become—at appropriate times—sites of personal and social reflection and what we might call “artivism,” as practiced by amateur and professional artists in every domain. The emotional significance of music has been a topic of scholarship for centuries. For example, Plato and Aristotle believed that happy-sounding music has the power to make people feel happy; sad-sounding music tends to make people sad. But is this plausible? Yes. Research in the last 15 to 20 years by today’s top music psychologists—including David Huron, Patrik Juslin, and many others—affirm that musical sounds can arouse and express a wide range of emotions. 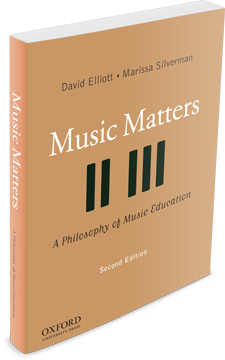 Indeed, today’s top neuroscientists, sociologists, and music philosophers make the same arguments—but with broader and deeper explanations—about many kinds of musical emotions and relationships (see MM2, Chapters 5 and 9). Skeptics (who tend to ignore current research) usually argue that when people listen to the sounds of instrumental music, there’s nothing to be happy or sad about, because nothing of human consequence has happened in the musical sounds that would cause listeners to feel happy or sad, or any emotion. But skeptics are wrong, because old, simplistic stimulus-response theories and abstract cognitive notions of the nature of emotions and emotional arousal have been replaced by more sophisticated understandings of the relationships between music, emotion, and personhood (see MM2, Chapter 5). Part of what’s going on is related to the importance of empathy. Empathy is not the same as sympathy, pity, or feeling sorry for another person, or agreeing with someone to make them feel good. Empathy implies that we adopt (consciously or non-consciously) the perspectives or emotional dispositions of another person in an effort to understand and respond compassionately, responsibly, and ethically. Without empathy, people would be strongly inclined to act selfishly, and group cohesion and collaborations would be unlikely, if not impossible; and, at worst, psychopathologies would be common. Thus, many neuroscientists argue that human beings are hard-wired for empathy. Experts in developmental affective neuroscience tell us that there’s increasing evidence that human infants are born with unified body-brain-mind systems that underpin our ability to develop naturally, informally, and formally the dispositions and abilities to respond empathetically to and for the benefit of others. So, empathy seems to be an innate human propensity. Why else would most parents automatically love and care for their babies, or bond together in families and groups? In MM2, we discuss the importance of empathy in music teaching and learning. Why? Because in the big picture, music can make huge positive transformations in people’s lives and communities. “Senseless” violence (e.g., the recent mass murder of nine people in a South Carolina church), racism, and other inhuman acts are not “causeless.” These acts can be prevented partly, if not largely, through education. So, we should pause and consider whether we’re “doing fully and rightly by/for” our students and their worlds. Is it enough for kids to learn how to perform accurately, play iPad music, or improvise jazz? We suggest that all of us can and should being doing more. Education(s) of all kinds, rightly understood, is the constant consideration of the persons in our care. If we truly care about our students and their worlds, if we educate our students towards respect and understanding, then we’d be better situated to help them develop and sustain a socially just commitment to others (see MM2, Chapter 4 and, for example, pp. 268-270). What does this mean for music education? Being an educative and ethical music teacher includes engaging our students—though all forms of musical engagement—in situations where they can learn and feel reciprocal processes of self-other growth, and the ways their emotions are affected positively and negatively by specific performers, composers, (etc). Sometimes musical emotions and memories ignite students’ energy, and/or make them feel sad, embarrassed, alienated, or disrespected. In the processes of music making and listening, students and teachers should discuss—from time to time, but never moving music from the center of music education—their musical emotions and the possible causes. 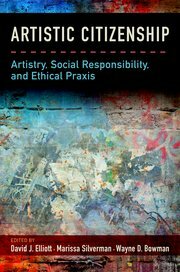 The point—which is absolutely NOT about reaching a consensus about what emotions a specific piece of music may arouse or express—is partly about learning how and why musicing environments should be conceived as musical-ethical communities where everyone receives and enjoys respect, acceptance, and personal fulfillment in and through music making. To build and maintain sustainable and resilient learning environments—to support and enhance students’ confidence, intrinsic motivation, and persistence—an understanding of holistic personhood (MM2, Chapter 5) is an essential part of knowing how, when, where, and how much to teach at any given time. And the key to unlocking these sustainable and resilient learning environments is compassion and empathy through musicing and listening (MM2, Chapter 9). How? Listeners can, and often do, empathize (consciously and/or nonconsciously) with musical sounds. This occurs because individual listeners mirror, respond to, and simulate internally what they feel a composer and/or performer(s) might be attempting to express emotionally, visually, and so on (MM2, Chapter 9). Through empathizing, listeners may/can feel “as if” they are experiencing the same feelings as the composer/performer(s) themselves. Feeling “as if” may be bodily: for example, synchronizing to/with musical rhythms/feels propels this phenomenon. Sometimes, listeners imagine via empathy what the performer feels when performing and moving with the music (e.g., audiences at a jazz, hip hop, or Taylor Swift concert); sometimes a listener imagines via empathy what a composer in Western classical music or jazz seems to have felt when composing. Performers often experience the same musical emotions for the same reasons. These emotions may be real or imagined; such connections may be felt while we listen or after. In short, affective connections between self and music (whether as a listener or performer) are relational and are imbued with empathy. In line with contemporary care ethics, empathy is receptive; it’s a non-cognitive assessment of another’s feelings, a state of being and feeling what another may be feeling. Understanding empathy as an integrated response process of body-brain-mind, cognition, and emotion (and more) is important for education generally and music education specifically. Helping students reflect on why and how they empathize, or not, with various examples of music is a way of helping them to understand their emotional selves. Musically, self-other reflection helps students learn to “read” each other’s expressive musical actions (phrasing, slight deviations in tempi, etc.) in order to collaboratively interpret a piece of music. In jazz, for example, this would be called feeling and creating the “groove” together. When students are alert to each other’s musical contributions through empathy, this often leads to expressive and joyful music making. Our concept of empathy in music education is a transactional concept of musical emotions, and music teaching-learning, that socially situates students’ efforts to “construct” their awareness (emotional, intuitive, bodily, reflective), as well as numerous musical skills, understandings, dispositions of compassion and empathy, habits of mind and heart, and ethical behavior in and through ecological relationships with their environmental circumstances—personal, familial, historical, social, cultural, technological, racial, gendered, economic, political, spiritual, and many other dimensions of life, whether inside or outside schools. Because music has enormous powers and potencies for “capturing” us physically, psychologically, socially, cooperatively, and more, shouldn’t music educators teach-for these potentials by teaching empathy in and through musicing and listening?